I was visiting Jaipur for work. I had some free time at hand so decided to visit the famous Choki Dhani. 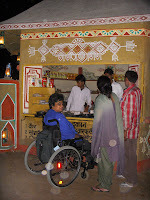 I had been to Jaipur several times before but somehow never got the opportunity to visit this village fair. I had no idea what to expect. All I knew was one could eat authentic Rajasthan cuisine here. Anyhow my bumpy ride continued till the person selling entry tickets and dinner coupons. Dressed as a traditional muneemji , he sat behind a wooden trunk on a platform surrounded by a number of visitors buying tickets. I waited patiently till my chance came. Sitting on my wheelchair I was not as high as him and knew that I would need to be a little aggressive to get my tickets. Just as I extended my hand with the money and craned my neck up to talk to him three sardaar men came and stood right in front of me blocking me out completely. I was irritated. It was like I did not exist. I revolted and said that I was in the queue before them, but that didn’t seem to matter. This kind of uncouth rudeness is probably only possible in India. I was irritated, angry and saw myself categorizing all men into being shameless, cheap, effeminate species. Suddenly all my excitement seemed to vanish. In any case I got me tickets next and wheeled towards entrance grumbling. There was a metal detector I needed to wheel through which was very narrow but just about broad enough to let my chair pass. Thank god for that because this was the only entrance they had – there wasn’t an alternate route. After my recent experience with the sardaars I was all ready to pick up a big fight though had my chair not passed through. I was in. The atmosphere was full fun, happiness and laughter’s of so many families that were there. Children enjoying the camel and elephant rides, adults enjoying the puppet show, dances, folk songs etc. There was a lot of festivity all around. Everyone seems to be enjoying themselves. I wheeled around the village. Looking at the various stall like areas that had been built in a large uneven muddy ground. I just wheeled a little before I tired out pushing myself on that ground. 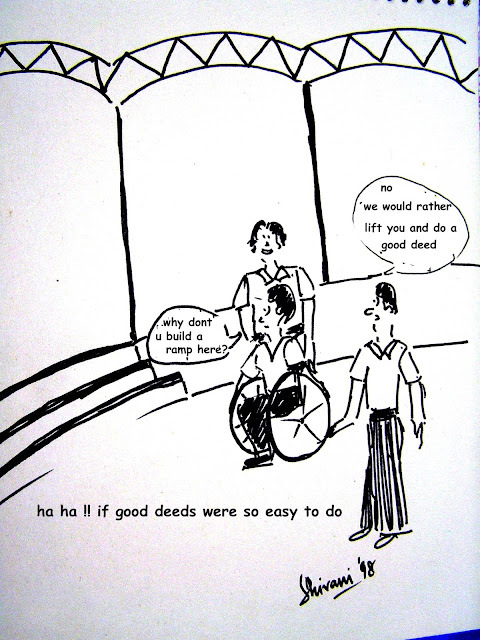 I really wished that the ground was firm and even or the Choki Dhani authorities had some electric wheelchairs that one could borrow. I knew it wasn’t going to be possible for me to actually enjoy the village, so I decided to go and eat the ‘Royal Thali’ instead. The Chaupad – the dinning area was a step up on a open courtyard kind of area. It was communal eating where everyone sat on the floor and ate out of leaf plates placed on a choki. The whole ambience was fascinating. Men dressed in traditional dresses speaking in Rajasthani served everyone. They had a style of serving that made you eat and eat and eat the large number of dishes that were served one after another. The food was delicious and not too spicy contrary to ethnic Rajasthni food. It had been adapted to suit all pallets. I of course could not sit on the floor. I requested them for a table, but what I got instead was three choki’s placed one on top of the other to get the leaf thali up to my height. While I sat awkwardly trying to eat from the thali but the delicious taste of food was worth the uncomfortable perch I had. The food seemed to have washed away the bad flavor of the three sardaars at the ticket counter and the discomfort I faced due to inaccessibility. 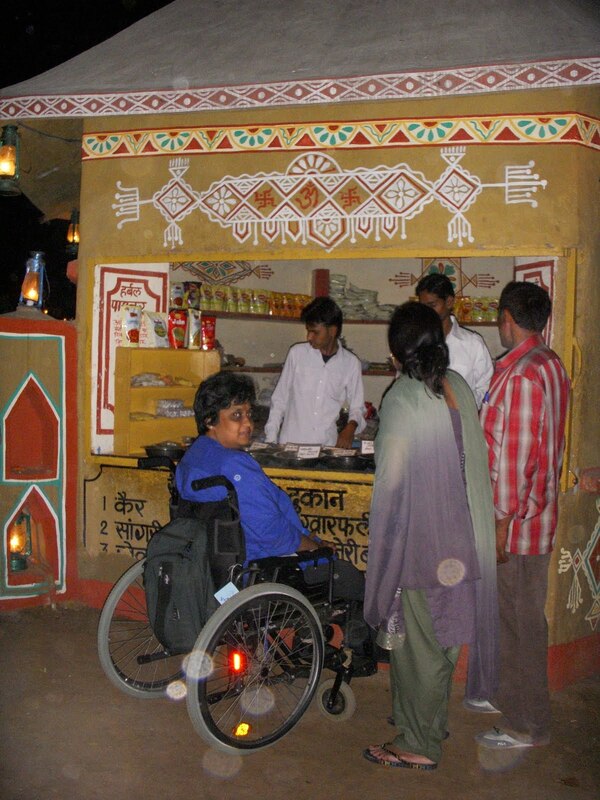 All in all I’d say the Chokhi Dhani is a must visit place if you are I Jaipur and when it comes to accessibility –it is not the most accessible place, but then lets just say that I’ve seen worse! As always you are positive! A beautiful place to visit. Thanks for sharing post on Chokhi Dhani. There are many events, activities and stalls inside the premises. 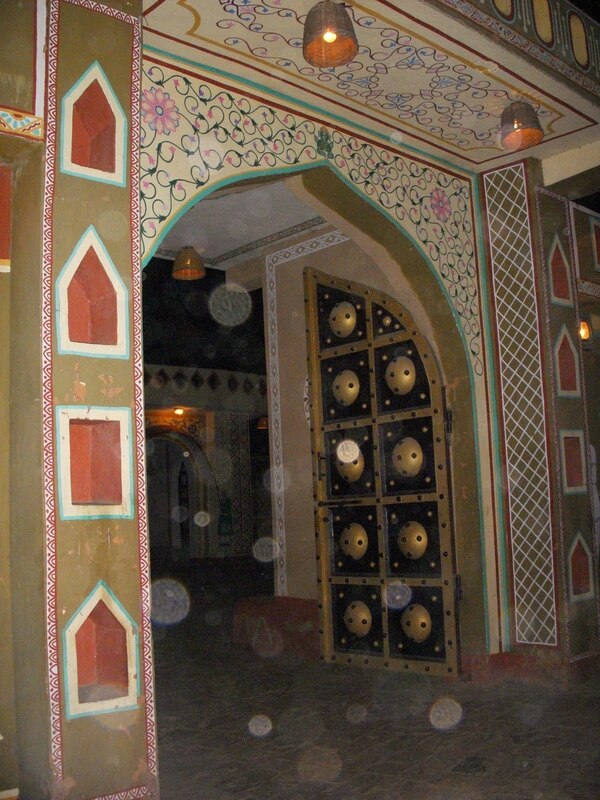 Chokhi Dhani Jaipur entry ticket varies according to the type of cuisine opted for. 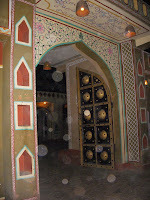 Its a must visit place in Jaipur.